Clock Barn Hall is an idyllic setting for your wedding, set in acres of farmland and horse paddocks, your wedding will feel intimate and private. 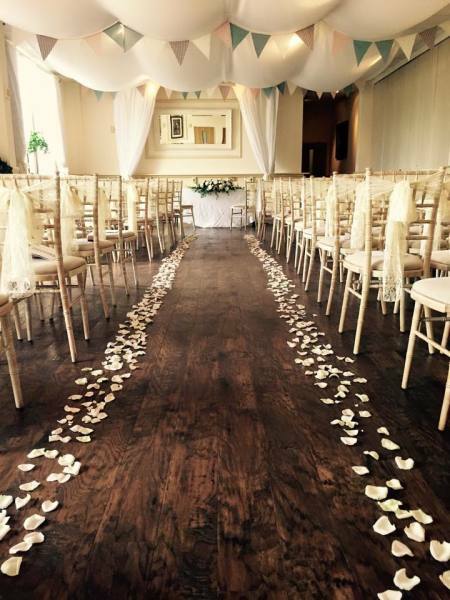 We are licensed to hold Civil Ceremonies for up to 100 guests. We offer a friendly and professional service that will help you through the whole event from the planning stages to setting up the venue right through to the end of the day. The ceremony hall is licensed for up to 100 guests. We are licensed for marriages and so you will be married on site. It is air conditioned with easy access to the toilets and a family room and bride's room. Its easy to book your Registrar who will attend with the Superintendent Registrar and the Register. The number you need to call is 0300 200 1002. The bride and groom will be interviewed for 10 minutes each separately prior to the ceremony taking place. A non-refundable deposit of £100 is payable to the Register Office, this is then deducted from the final payment. The price is dependent on the time of year but budget for approximately £500. The price is inclusive of two marriage cerificates. Civil ceremonies are exempt from VAT. Once the ceremony has taken place and your photographer has captured your confetti moment, our caterers will be on hand to serve your reception drinks. Dependant on the weather, we like to host your drink receptions in our rear garden area where you and your guests can mingle and relax prior to your wedding breakfast. In case of rainy weather then the reception may be held in the ceremony hall at no extra cost. ​We do not charge corkage on your reception drinks or wine on the tables during your meal. Our fully stocked and staffed bar opens once the meal has ended, or at 6pm - whichever is earliest, guests are then able to purchase drinks from our bar. If you would like to open the bar prior to 6pm please let us know, there will be additional charges based on an hourly rate. If you would like a pre-paid bar then this can be arranged. Based on your evening guest numbers you may wish to have both sides of the hall opened up into a larger evening reception area, we will ensure that the ceremony room is cleared and ready for your evening guests and entertainment that you have organised. Our bar is open until 12am, at this point we will stop serving and we ask that you ensure that your music entertainment also stops at midnight. Carriages should coincide with the bar closing. ​We know that you will put a lot of effort into making your wedding day look special. So we invite our couples to take advantage of decorating the hall just the way they would like it the day before the wedding. This we have found is a great help to couples as they can set everything up, have a practice of the ceremony and make sure everything is in place for the big day. Then all you need to do is enjoy the day iteself without the stress of setting up on the same day. Likewise the same applies to clearing down your decorations, you may return on the Sunday to take away your decorations, leftover drink and cake. Stress-free! We require a security deposit of £250 to be paid prior to the event. Once the venue has been cleaned by our cleaners and all furniture checked, then the security deposit is returned to the customer within 7 days of the wedding.